During the melting and plasticizing process of the plastic, the melt material continuously moves to the front end of the barrel(metering chamber), and more and more, gradually forming a pressure to push the screw backward. In order to prevent the screw bakcward too fast and ensure that the melt is evenly compacted, it is necessary to provide a reverse pressure to the screw. 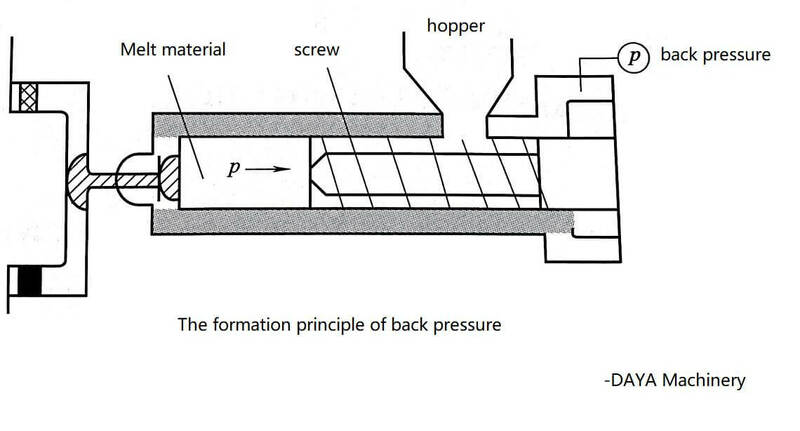 This reverse direction pressure which prevent the screw backward is called back pressure, as shown in the figure below. Back pressure is also called plasticizing pressure, and its control is achieved by adjusting the oil return throttle valve of the injection cylinder. The back of the pre-plasticized screw injection cylinder is equipped with a back pressure valve to adjust the speed of the injection cylinder to unload the oil when the screw rotates backward, so that the cylinder maintains a certain pressure. The screw back speed (resistance) of the all electric injection molding machine is controlled by the AC servo valve. It can compact the melt material inside the barrel, increase the density, increase the injection weight, and stabilize the weight and size of the product. It can “extrude” the air inside the melt material to reduce the air on the surface of the product, internal bubbles, improve gloss and uniformity. Slow down the speed of the screw back, ensure fully plasticize the melt in the barrel, increase the mixing uniformity of the color masterbatch and melt material in order to avoid color mixing. Properly improve the back pressure can improve the problem of shrinkage of the surface of the product. It can raise the temperature of the melt material, improve the quality of melt plasticization, improve the fluidity during melt material filling into the mold cavity, and make the product surface free of the cold material mark.